But Are You Missing Something? What Makes White Orthodontics Different? The cost of braces is one of the biggest obstacles to starting treatment. We want to make the most effective orthodontics available and affordable for you or your loved one when you walk through the doors of our Glen Allen orthodontics office.Our zero financing plans, along with our family discount plans, make it easier for you to afford braces for you or your family members. 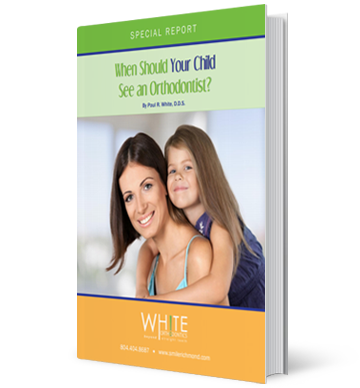 At White Orthodontics, we stand behind our orthodontic treatment for you and your family. During your White Orthodontics Bio-Esthetic Smile Analysis, ask for more details on the White Orthodontics Lifetime Guarantee. At White Orthodontics, you can expect 5-star service from every member of our orthodontic team. Our front desk team will kindly greet you to make you feel like you are a welcomed member of the White Orthodontics family. Our team of orthodontic assistants are sure to make sure you are comfortable and informed of your appointment itinerary. Then our orthodontist will be informative and address any questions or concerns you may have about your braces, treatment and its progress. A straight smile not only provides esthetic benefits, it promotes healthier brain activity with an overall sense of well-being. White Orthodontics is concerned with the function and form of your teeth and jaw, which is very important during the treatment process. Many people are busy these days, juggling responsibilities such as work, school, and extracurricular activities. Time is a crucial factor when it comes to things like braces. At White Orthodontics, we understand how important it is for appointments with an orthodontist in the Richmond area to fit into your busy schedule. Because we value your time, we ensure all of your appointments start on-time! "We came to see Dr. White after completing orthodontic treatment with another orthodontist. We were so disappointed with her results which had her teeth in a very unattractive position. Our daughter was resistant at first which was understandable as she was in 8th grade. She now loves her new smile and is happy that she got braces “one more time” to get it right. Dr. White’s staff, especially Kristi, was very professional, and made the visit fun. Dr. White is a perfectionist who has made sure that her bite and smile are just right. The whole staff is very supportive, informative and helpful. Our experience here was so different from the other orthodontist who was considered one of the best in Richmond. There is no comparison to the orthodontic treatment my daughter received here. Dr. White has the latest treatment techniques. We have been so happy that besides my daughter, my son and I also are receiving treatment. I look forward to the day when my own braces come off and with the change so far, know that it will be a great improvement to my bite and smile. We recommend Dr. White to everyone we know who is considering orthodontic care." "I am the father of 5 children & remember the first time I started looking for an orthodontist for my oldest child. I quickly realized I had no idea how to make sure I was selecting an excellent orthodontist. We did our best, but, unfortunately, we chose an orthodontist who gave my daughter a pretty smile but also a jaw with new clicks, pops, and discomfort as well as recurring headaches. Following a relocation, we found another orthodontist who uses unique techniques we learned were called the Roth Williams philosophy. Under this method, orthodontic treatment is used to obtain not only a pretty smile but also healthy jaw function — at the same time. My daughter had to be retreated, but this orthodontist had the techniques to fix the clicks, pops, and discomfort. When I moved to Virginia, I found that Dr. White is one of the few orthodontists in the region from the Roth Williams school. I was happy to drive 2 hours to Dr. White for my daughters and me. Dr. White and his team surpassed my expectations. Dr. White is amazing & gives 110% to make sure your teeth & jaw are perfect. And his entire team is highly competent & pleasant. We got great results — the first time! I wouldn’t go anywhere else. Love these guys!"